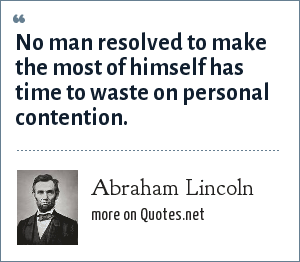 Abraham Lincoln: No man resolved to make the most of himself has time to waste on personal contention. No man resolved to make the most of himself has time to waste on personal contention. "Abraham Lincoln Quotes." Quotes.net. STANDS4 LLC, 2019. Web. 23 Apr. 2019. <https://www.quotes.net/quote/42151>.